Being on a show like Mythbusters it is pretty obvious that Adam Savage has a passion for making things. A person that makes things ranging from a small knick knack to a large catapult ultimately requires that he has a part for every situation and in every size. So with that many parts, how does he stay organized? 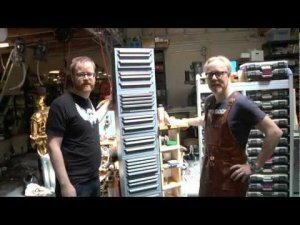 One of the ways Adam Savage keeps his small parts organized is by using a crazy amount of Sortimo T-BOXXs (video below). These boxes are made by the same company that makes the L-BOXX system for Bosch. So why did he chose the T-BOXX? It features a see-through lid so all the items inside are easily visible, it has removable insert containers of all shapes and sizes to fit what you need, and it is incredibly durable. Unfortunately the Sortimo T-BOXX might be out of reach for most of us. Sortimo is headquartered in Germany and all of their products have to be imported. Bosch has done a good job of making the L-BOXX available in the States, but the rest of the Sortimo line has to be ordered directly from Sortimo US or from one of the few US dealers. Either way, they are not cheap. It's sad, because they look really awesome.